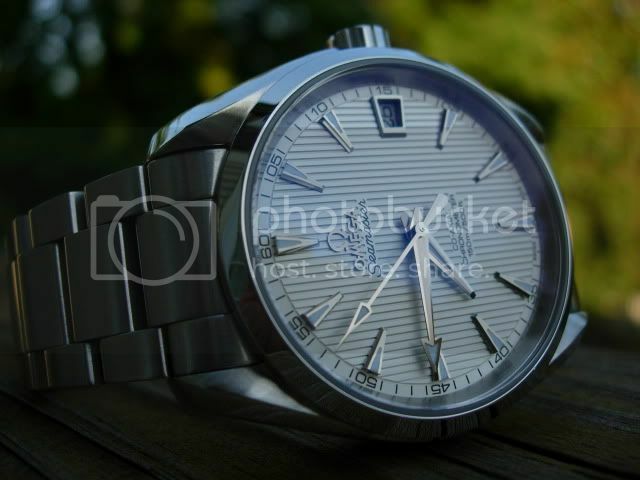 I didnt really see many pics of the AT 8500 with the silver teak dial though. is it not popular? Mr Fjeld, JarrodS, vlad.ica and 1 others like this. Ahh.. I reckon I've gone through this thread at least 10 times while I wait for my own AT to arrive. Oh the suspense! This thread has some absolutely STUNNING pics in it. I was fairly set on buying a new PO, but now I must confess that I'm torn with the possibility of an AT! My current collection of Hamilton's and Seiko's do not even come close to comparing to these Omega's! You know, if the Railmaster had a date window ( hard with the 3,6,9 configuration), I would be tempted to flip my AT for one - love the lumed hands and markers, but I really like having the date feature of my Cal 2500 AT and pretty much everything else about it. The lume of the Railmaster is appealing, though. Geat thread. Is it the angle of the photo or does the date really say 0? No, the sharp shadows are obscuring the "1", I took the photo yesterday on the 10th. Couldn't let this thread fade away. Here's mine. I love this design. Once flipped it, then regretted it, then had to pay much more to get one back after Omega discontinued them. But...here is. Classic. vlad.ica, calv1n, Kenzembo1 and 2 others like this.